In the jazz world, Barry Harris came up with the idea of harmonizing a bebop scale. Every pair of chords have all the 8-note set. 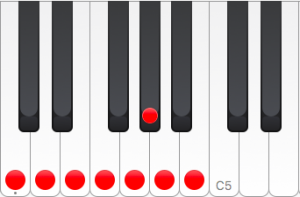 The notes C,E, G and A are always harmonized with a C6 chord. The notes D, F, Ab and B are always harmonized with a Bdim7 chord. So, from the point of view of sets, there is no problem. from the melody as an OMN expression. If the note is an C (in any register), I will apply a chord like , I will add the notes A, G and E, below the melody. If the note is an (in any register), I will apply a chord like , I will add the notes G, E and C, below the melody. If the note is an B (in any register), I will apply a chord like , I will add the notes Ab, F and D, below the melody. I need first find a way to apply a specific procedure only over the notes I want, over all the C notes, all the B notes, etc. How to filter from an OMN expression ? Given and OMN expression, how can I apply one operation (like transposition, for example) to just the C notes, or just the B notes (in any register)? This would be great to make fast block harmonizations for arrangements. I would need a few examples, input and output to see how could this work in our system. The chord generators in the system (as far as I know) are root based systems, i.e., they buid chords stacking notes over a root. When you work a saxophone soli section in a big band arrangement, you use a top to bottom approach, i.e., you start with the melody of a song or an origianl tune (think a Charlie Parker bebop head) and you build an harmonization under it. The melody becomes the top note of a 4-part harmonization. We use some rules to determine wich chord will be used in each case, depending on the melodic function. In the above example, the notes C, E, G and A will be always harmonized with the corresponding close position inversions of the C6 chord while the B, D, F and Ab will be always harmonized with the corresponding close position inversions of the Bdim7 chord. We need a function that will transform a melody to a 4-part harmonization, similar to chord-interval-add function. This will result in a 4-part harmonization, but this is not "note selective", it will apply the same interval series over the entire list of notes. I need a filter to apply diferent series of intervals over each different note. Over all the C notes, I want the (-3 -2 -3) as interval add. Over all the E notes, I want the (-4 -3 -2) as interval add. Over all the G notes, I want the (-3 -4 -3) as interval add. This is the Barry Harris Rule for harmonizing a bebop scale. So I need a chord-interval-add function with note selection (a kind of IF - DO filter): IF this is an C note (in any register) DO ADD this interval list (-3 -2 -3) from the melody, forming a 4-part C6 chord with melody on top. IF this is a B, D, F or G#/Ab note, ADD this interval list (-3 -3 -3) from the melody, forming a 4-part Bdim7 chord with melody on top. originally, i've made gen-chord3 with JP for using in this top to bottom approach. what is called root in gen-chord3 parameters was not thinked by me originaly as "root" but more cantus note on with to add other notes (below or not). But naturally, the gen-chord3 function is not conditionnal, so we have to think about something else but i think you can do that with pattern-match function. Any way of filtering actions based on specific pitch classes ? Is there some WILDCARD to mean all C pitch classes? If no, I will have to program it for all the octaves of the range of the melody. For example cs$ or cs? meaning all C# in ANY octave. I found a solution with pattern-match. Thanks a lot Stephane!! Looks Great! !